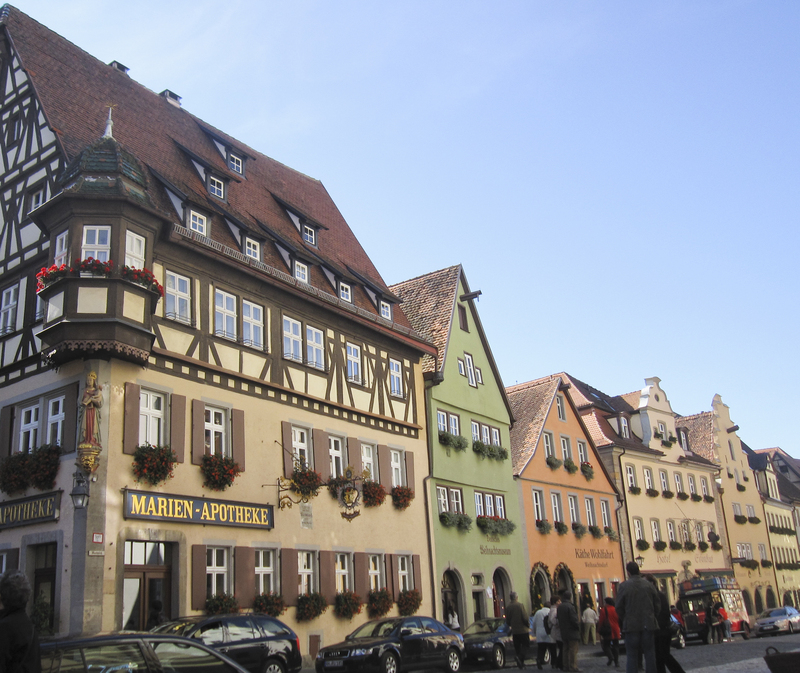 I don’t think I’ve ever mentioned Germany in a post before, which is odd because, of the places I’ve traveled, Germany is one of my favorites. 1.) 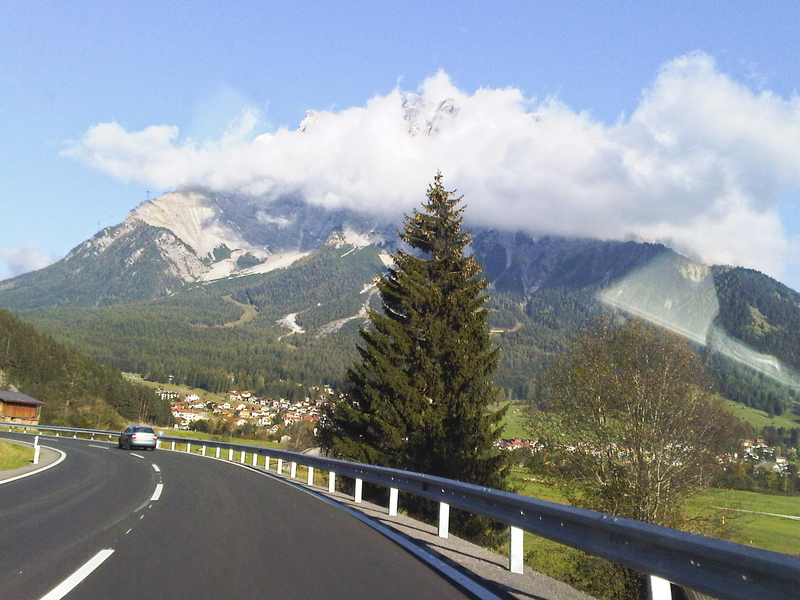 Touring the Alps region will leave permanent imprints on your memory and heart. The exaggerated, extravagant, over-the-top natural beauty of this country stretches for miles in all directions – in front of you, behind you, and towering above you (notice the peaks rising far higher than the clouds for a better idea of the super-sized scale of the mountains). 2.) While touring the country, odds are good that you’ll stumble upon a medieval town, complete with hand-laid cobblestone streets, so endearingly quaint and colorful, it looks and feels like stepping into an illustration from a children’s fairytale. 3.) The autobahns (the German highways). Germans know how to drive, and here’s how: if you’re not doing 90 mph on the highway, you had better get yourself out of the left lane. Also, when you rent a car in Germany, you get a BMW for the price of a small Honda in America. To sum it up: it’s a lot of fun to drive in Germany. 4.) The food is incredible! I visited in early October, and after a long, chilly, windy day filled with walking, it was wonderful to stop into a warm café – complete with fireplace, cozy low ceilings, and flowering plants decorating every nook – for some creamy pumpkin soup and chicken schnitzel (lightly breaded and fried chicken) with potato and chive salad. Germany has amazing sweets and pastries too. 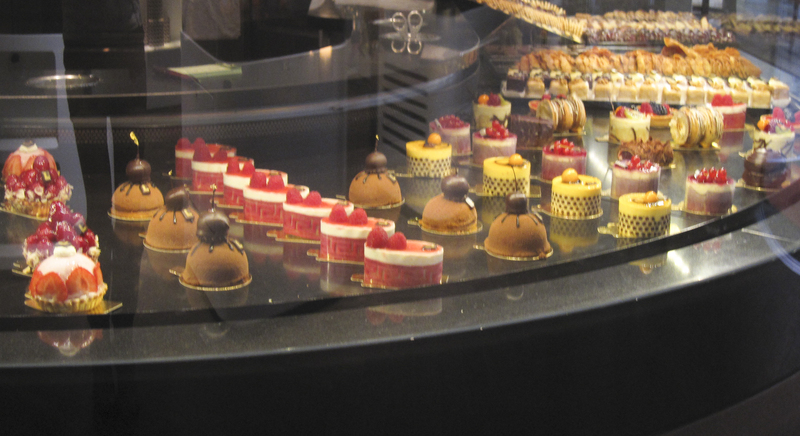 (This photo was snapped at a favorite bakery in Munich). So this indulgent recipe for Black Forest waffles (based on the chocolate and cherry Black Forest cake that originated in Germany) is my ode to Germany. I created this recipe for my husband for his birthday breakfast, since chocolate and cherry is his favorite dessert combo. It’s such an indulgent breakfast, it’s perfect for a birthday. Or any time you want to do something special for breakfast. It could even pass as a dessert. But here’s the best part: it has so many healthy ingredients – like whole wheat flour, low-fat yogurt, and cherries – that it’s also guilt-free! 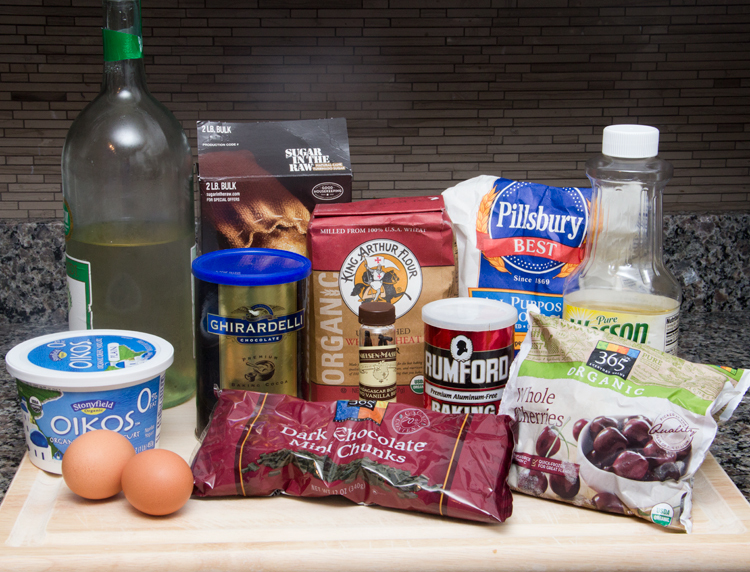 Here are all of the key ingredients you’ll need to make your own Black Forest waffles. Using a small saucepan, boil some white wine and some water. 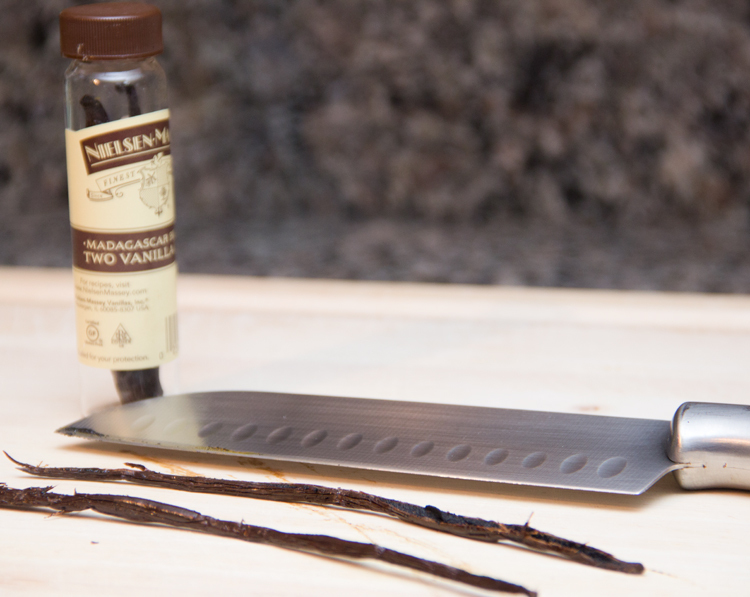 Grab a fresh vanilla bean and cut it in half lengthwise. Toss both halves into the to the pot, and allow everything to simmer for a few minutes. Next, add some sugar and stir until it’s completely dissolved into the liquid. Finally, add a bag or two of frozen cherries to the pot and adjust the heat to low, bringing everything to a light simmer. I’ve been trying to add more cherries to my diet since I learned they’re a superfood with very high antioxidant levels. These antioxidants are anti-aging and they help boost the immune system and prevent cancer. Cherries also contain lots of potassium (to help maintain healthy blood pressure). And they’re very low in calories with lots of fiber (helps you feel full and aids in weight loss). So I usually add an extra side dish of cherries in addition to topping the waffles with them! 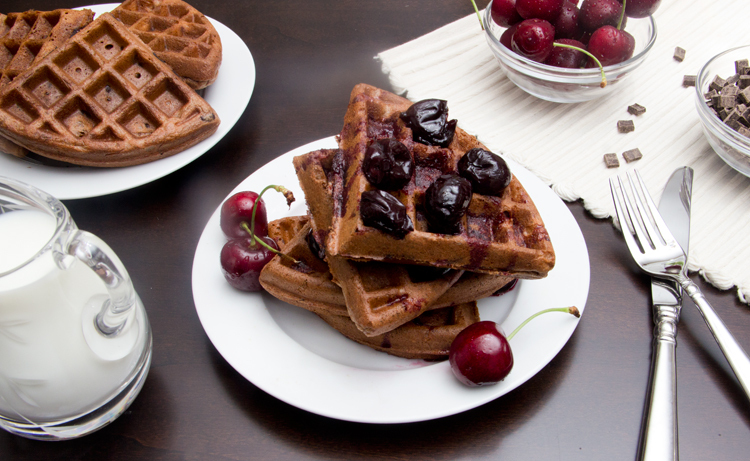 While your cherries are simmering away, begin whipping up your waffle batter. Add the following dry ingredients to one large mixing bowl: all-purpose flour, whole wheat flour, cocoa powder, baking soda, baking powder, salt, and sugar. Add the following ingredients to a second large bowl: eggs, milk, plain low-fat Greek yogurt, and some canola oil. Use a whisk to stir everything together. Slowly add the wet ingredients to the dry and whisk again. Last, the most important ingredient: dark chocolate shavings! 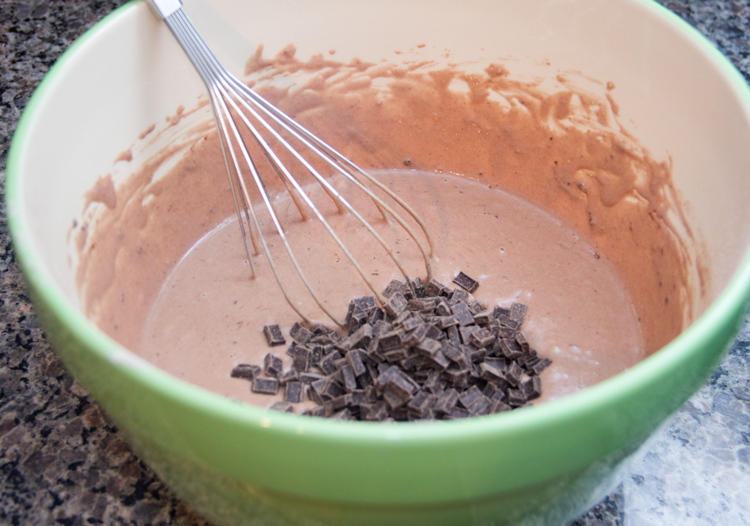 Slowly stir the dark chocolate shavings (or dark chocolate chips) into the batter. Prepare the waffles according to the directions for your waffle iron. Here’s one tip: before cooking your waffles in your waffle iron, be sure to coat the iron with just a bit of canola oil. Pour a small amount of canola oil onto a towel and coat the iron with a light coat of oil (before you turn the iron on!) Or just spray the iron with some non-stick cooking spray. This is important because as the chocolate shavings melt, they can stick to the waffle iron, making it hard to remove them from the iron when they’re finished. Last tip (I promise! ): you can keep waffles warm (so everyone can sit down to eat at once, after all the waffles have been cooked) by placing them on a baking sheet in an oven preheated to about 250 degrees F.
When your waffles are cooked, top with plenty of poached cherries, and drizzle some of the poaching liquid all over the waffles in place of maple syrup. This is one rich, decadent breakfast treat! 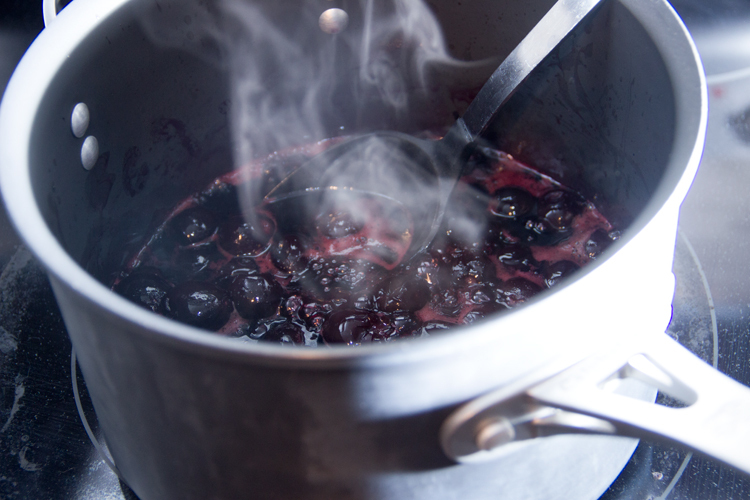 The cherries are slightly tart and slightly sweet from the poaching liquid. And the chocolatey waffles have rich, sweet, melted dark chocolate in every bite. Make these for a special brunch, or for a birthday breakfast feast. Or anytime you’re craving something a little sweet and sinful for breakfast! 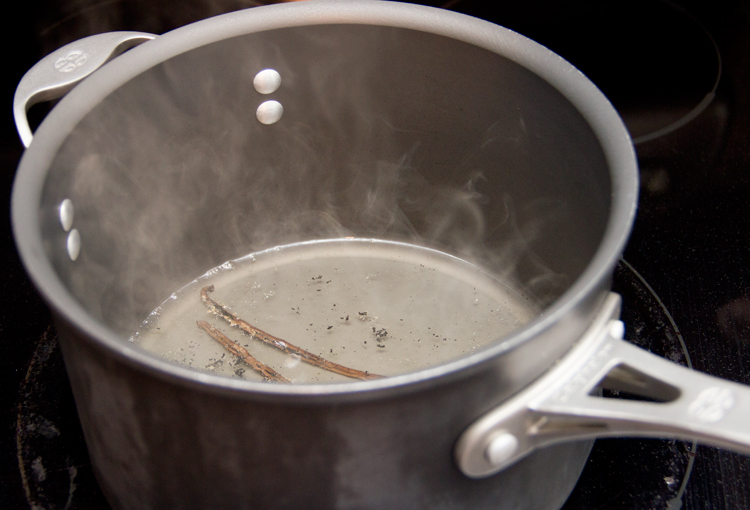 Place the water, white wine, and both halves of the vanilla bean in a saucepan over medium-high heat. Bring to a boil and then reduce heat to a simmer. 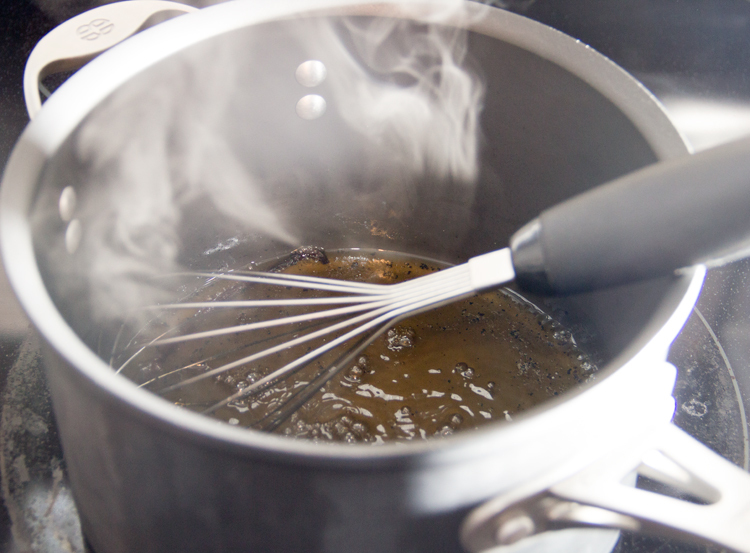 After 5 minutes, add the sugar to the simmering liquid. Stir until sugar is dissolved. Add the frozen cherries and continue to simmer for 7 minutes more. Remove the vanilla bean before serving. While the cherries simmer, heat a waffle iron according to product instructions. In a large mixing bowl, stir and combine the dry ingredients: whole wheat flour, all-purpose flour, cocoa powder, sugar, baking powder, baking soda, and salt. 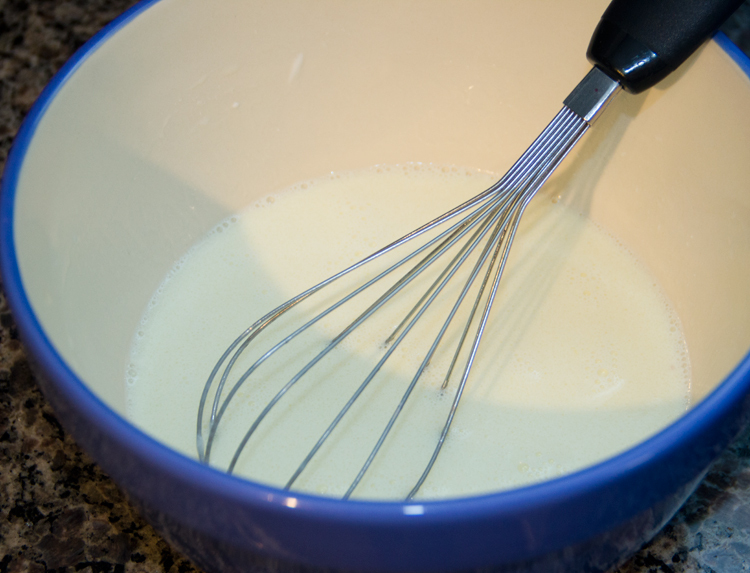 In another bowl, whisk together the wet ingredients: yogurt, eggs, milk, and canola oil. Pour the wet ingredients into the dry, and whisk until everything is well combined. 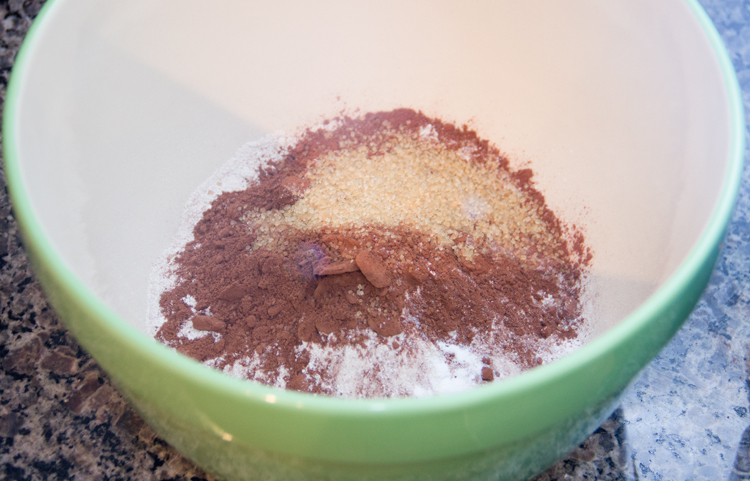 Add the chocolate shavings and fold them into the batter. 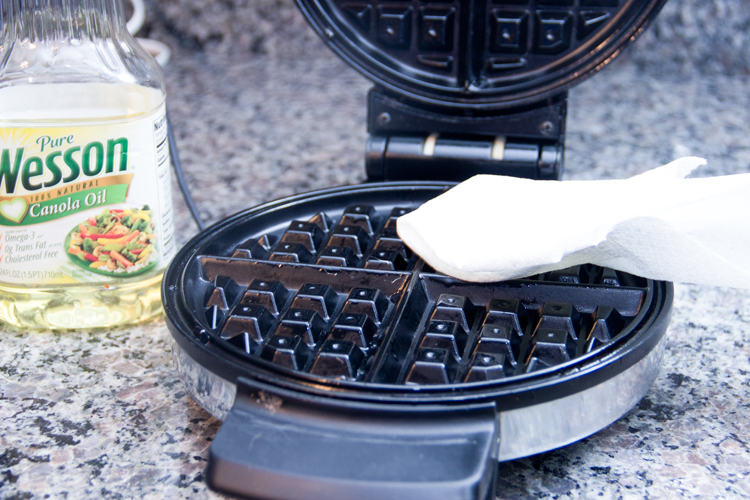 Using a towel, coat the waffle iron with a thin layer of canola oil. Or spray the iron with a non-stick cooking spray. Use a measuring cup to ladle the correct amount of batter onto the waffle iron. Close the iron top and cook until the outsides of the waffle are crisp and easy to remove from the iron. Repeat until all batter is used. Keep waffles warm during the cooking process by placing them on a baking sheet in an oven warmed to 200 degrees F.
Top each waffle with plenty of poached cherries. Drizzle the poaching liquid over the waffles in place of maple syrup. Serve. Bread in Germany is incredible. I’m pleased you enjoy Germany so much. The alps are the most beautiful mountain range in the world. The Rockies are accessible but the Alps are just mind blowing. Love your waffles and cherry sauce. They look so moreish. For the most amazing Black Forest Gateau that has ever existed google Heston Blumenthal’s version. Not sure if you’ve heard of this guy in the states but he is a culinary genius, simple as that. The Alps – amazing. I can’t even imagine what it would be like to be near them! The “creamy pumpkin soup” caught my eye. Do you have a good recipe for that? I’m a huge fan of pumpkin and of soup – the craze hits me every fall! Wow, these look amazing!!!!! Love your pictures from Germany!!!!! 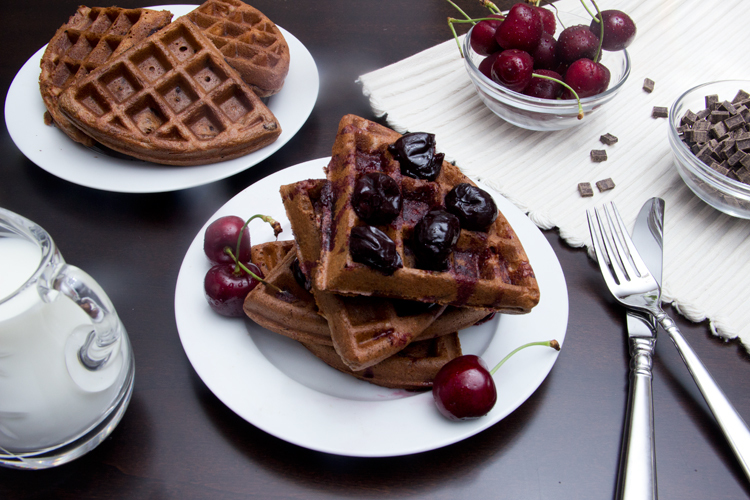 I love chocolate with cherries, these waffles look heavenly! Chocolate and cherries…mmmm! These look so great. 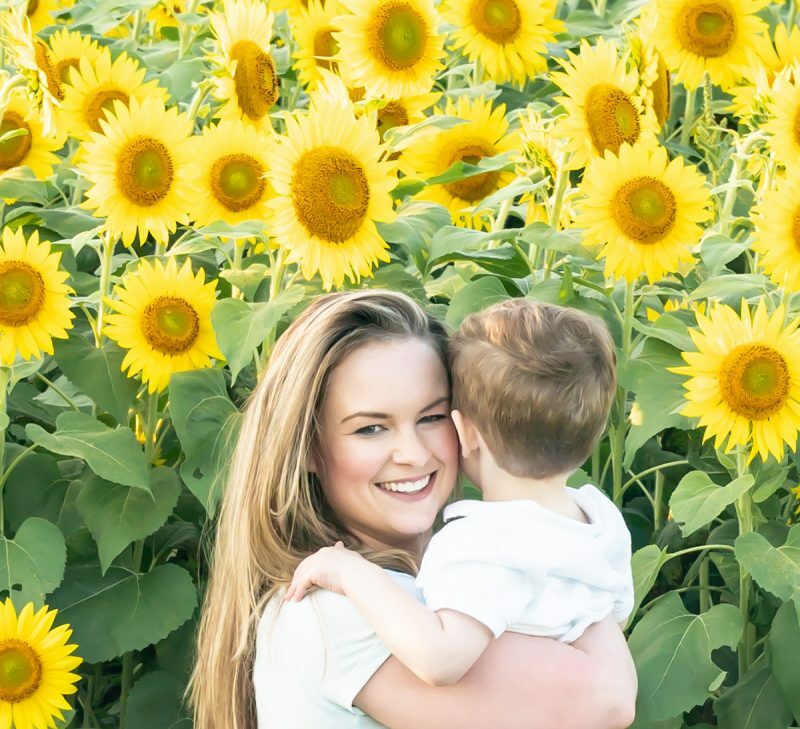 I’ve only been to Munich (and really liked it), but I lived with a German girl in France and what I’ve seen and heard from her makes the rest of Germany sound amazing too! Wow! 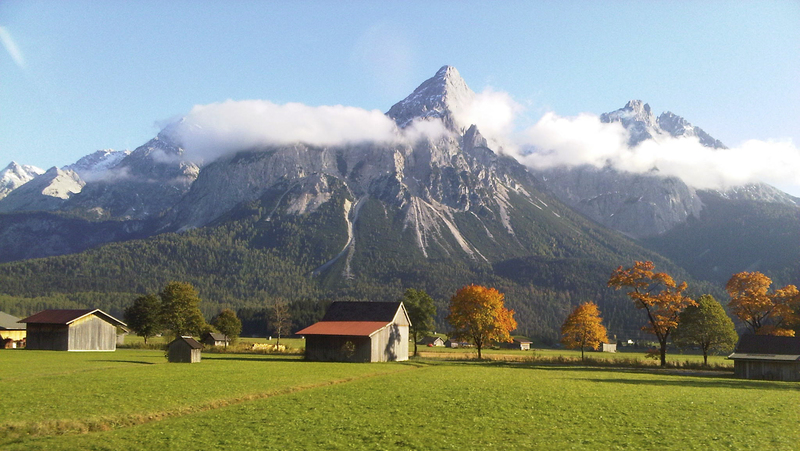 Your pictures are breath taking and sure do make me want to go to Germany. Also looking forward to trying these waffles. Yum! Oh, how I love waffles. 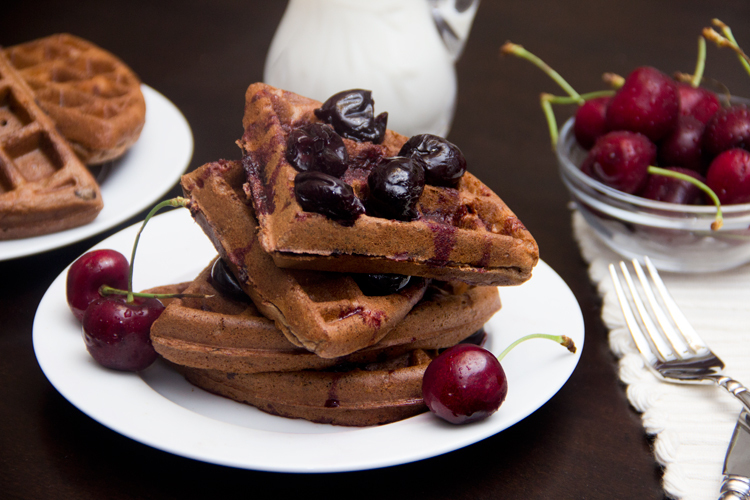 Waffles + chocolate + cherries = decadent! Your husband is a lucky man! I only know the Baltic coast in Germany, so have a very different view of it geographically. The Alps look so stunning. Any waffle recipe with dark chocolate and cherries has got to be worth trying and this looks amazing (as always!). The inclusion of white wine is intriguing too! You said it girl – a decadent breakfast for sure, but OMG – I wouldn’t be able to stop eating this! 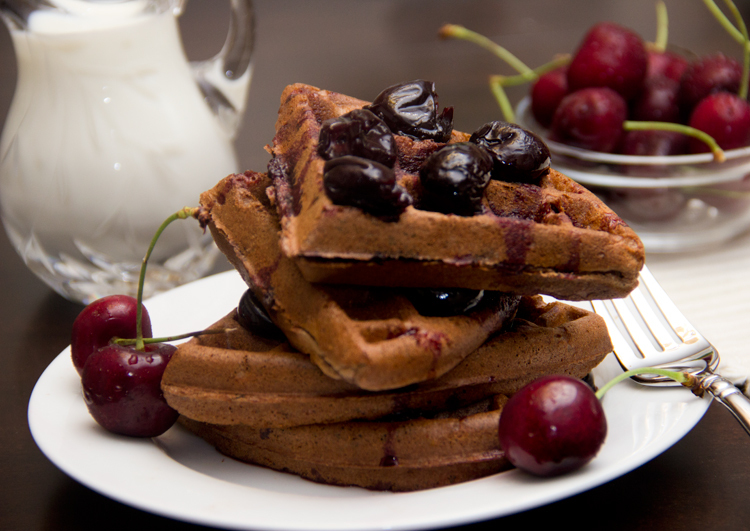 The waffles by themselves are fabulous but then topping with the cherries – total decadence! So did you serve these on your good china? 🙂 PS – how’s Calvin? Never been to germany but i will definately be trying this! What a decadent way to start the day. I will be traveling in Germany again in a couple of weeks. You are right about car rental prices…a Mercedes with GPS for $700 for three weeks plus. 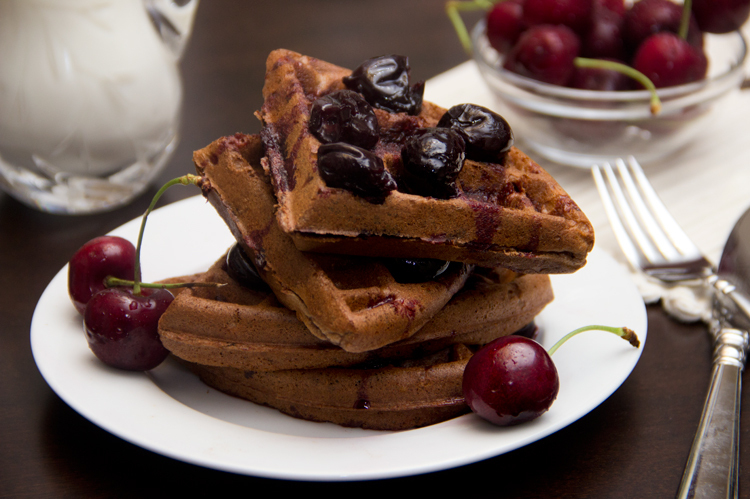 Waffles are one of my favorites and to pair it with chocolate and cherries! Fantastic! How lucky that you’ve traveled to Germany! It’s definitely on my list. These waffles look so decadent and wonderfully delicious! Welcome back! I missed your posts but now you’re back with a fabolous sweet: love cherries with chocolate! These are the most decadent waffles ever! Definitely need to make them for Sunday brunch. And I totally need to make a trip to Germany! Thank you for this wonderful waffle recipe, and for the handy hint about using a measuring cup to measure the batter to go into the waffle iron. Love the photographs of Germany. I NEED A WAFFLE IRON! This looks so so good! Wow, these waffles look delicious! Happy you’re back! Oh my god, those look absolutely delicious!